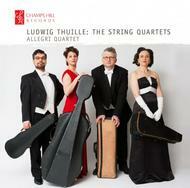 Champs Hill Records continues its survey of the neglected music of Ludwig Thuille with a new recording of his String Quartets Nos 1 & 2, performed by the Allegri Quartet. Leader Ofer Falk describes in the booklet how he came to know Thuille�s music through a chance encounter with a score for one of the Quintets (which the Allegri Quartet have recorded for Champs Hill Records, available on CHRCD002) - music left behind in a piano stool given to a friend. Born in Bolzano (Bozen), capital of Southern Tirol, Ludwig Thuille lived and created in fin de si�cle Munich and was one of the leading forces in pre World-War I Germany. His operas were successfully performed in central opera houses from Moscow to New York. His vocal and instrumental pieces were often performed in Europe's main concert venues. His treatise on harmony (Harmonielehre) became a standard textbook throughout Europe and many of the continent's musicians were brought up on Thuille's harmonic thoughts and conceptions.